Paper and ink have enabled the first edition of the Observer’s Handbook to survive for more than a century, and digital technology now makes it accessible to anyone. The object has been to produce a companion which the observer would wish always to have in his pocket or on the table before him. It was the first annual guide for observational astronomy to be published in Canada. 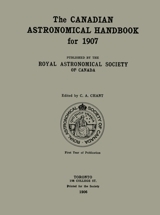 Titled The Canadian Astronomical Handbook for 1907, a second edition followed for 1908, but for the next two years most of the information that would have appeared was published instead in installments in the Journal of the Royal Astronomical Society of Canada. The Council of the Society decided to return to a separate publication for 1911 with a new name, the Observer’s Handbook, and it has been published annually ever since. Thus the 2008 edition was the 100th. Chant’s continuing creation is now one of Canada’s oldest scientific publications. Exclusive of pages devoted to a list of officers and by-laws of the Society, the first edition has 100 pages. Not until the 1968 edition, when Ruth Northcott was editor, did the number of pages devoted to astronomy again reach 100. In subsequent years the page count has more than tripled. The Handbook also increased in page size. The first two editions are small, only 12.5 x 17 cm. With the 1911 edition the Handbook reached its current dimensions: 14 x 22 cm, too large for the average pocket! Chant assembled five “Contributors” in addition to himself to provide material for the 1907 Handbook. Among these was Andrew Elvins (1823-1918) who contributed the section “Observing the Sun, Moon, and Planets” (pages 40-44). Elvins, then 83 years of age, had been the guiding spirit of Canada’s first astronomical society, The Toronto Astronomical Club, that began in 1868 and eventually became the Royal Astronomical Society of Canada. Chant regarded Elvins as “the true father of the incorporated society”. Through Elvins, the Observer’s Handbook has a link going back more than 140 years to the origin of the RASC. The Observer’s Handbook owes its character and success to Chant’s system of contributors. The 2009 edition represents the efforts of 54 contributors (40 from Canada, 14 from other countries), plus the Editor and his 3 assistants. In addition to its emphasis on astronomical phenomena of the year 1907, other aspects of the first edition reflect that Edwardian era. As Chant mentions in his Preface: “Our country is still young . . .” The Titanic, Vimy Ridge, and income tax were still in the future. Among the list of dates on page 8 is “Accession of King Edward VII . . . Jan. 22”, the event that marked the end of the Victorian era only six years earlier. Edward VII was particularly prominent in the Society’s thoughts for he had granted the Society its royal designation in 1903. Astronomy has advanced dramatically since that first edition. For example, in 1907 no one knew what made the stars shine. Atomic spectra were a mystery. There was no Hertzsprung-Russell diagram. Galaxies were not part of cosmology. In J. Miller Barr’s long article on variable stars (pages 58-69), the term “supernova” does not appear, although some are included in his list of “New Stars”. Although the Society was based in Toronto and its first Centre was then being planned in Ottawa, Chant had all of Canada in mind when he assembled the 1907 Handbook. “Geographical Positions” (page 34) span Halifax to Victoria, and include two places north of latitude 60°N: Fort Simpson and Herschel Island. Tables for the rising and setting of Sun and Moon (pages 10-33) include Halifax and Saint John, Quebec City, Toronto, Winnipeg, Vancouver and Victoria. (It would be another 42 years before Newfoundland became part of Canada.) Nevertheless, because nearly all Handbook users (mostly Society members) then resided in southern Ontario, Chant gave the times of events, such as eclipses, in “75th Meridian Time” (Eastern Standard Time). Not until 75 years later with the 1982 edition was the Handbook switched to Universal Time (UT). The list of planets (page 45) is up-to-date! Pluto was discovered nearly a quarter of a century later, but a century later Pluto was officially recognized as being but one of countless smaller bodies composing the Kuiper Belt. However, Mercury and Venus were thought, incorrectly, to have rotation periods equal to their orbital periods, and the rotation periods of Uranus and Neptune were unknown. In contrast to the unchanged number of planets, the number of known satellites of the planets (page 46) has exploded. For Jupiter the number has gone from 7 in 1907 to more than 60 today. For Neptune the relative increase is even more dramatic, from 1 to 13 (as of 2009). As one would expect, the satellites listed in the 1907 Handbook include all that are visible in a small telescope. An example of the more informal approach to scientific topics a century ago occurs on pages 70 and 71 where “The Most Beautiful” double stars are listed. They are presented in two categories: the most luminous pairs as “Diamonds”, and the finest coloured pairs as “Rubies, Garnets, Sapphires, Topazes, Emeralds”, with colours given by various terms such as Lilac, Golden, Azure, and Rose. That terminology certainly is more generally appealing, albeit less informative, than the cryptic spectral classification scheme developed in the following decades. Moving forward a century, I am pleased to see that a “new” section, COLOURED DOUBLE STARS, appeared in the 2009 Observer’s Handbook, thanks to a new contributor Michel Duval and the support of Editor Patrick Kelly. Not surprisingly, the 1907 and 2009 lists have many stars in common. Duval’s list will be particularly useful for those showing the public the night sky. As a former Editor of the Observer’s Handbook, I had 19 unsuccessful attempts at producing an error-free edition. Thus I empathize with Chant for errors I spotted in his first edition (for example, on page 7, 360° should be 330°; on page 45, 0.75 should be 0.075). Enjoy this significant document of Canadian astronomy, reflect on how much our understanding of the universe has advanced since 1907, and appreciate the vision of that outstanding member of the RASC, Clarence Augustus Chant.